Why watch Metropolis, the Frtiz Lang silent classic that debuted in Berlin in January of 1927? Yes, the film has historical importance vis-Ã -vis cinema in general and German expressionism in particular. And, yes, Lang created a futuristic vision that impresses, even in a time when computer-generated imagery has become so common we hardly give it a second thought. And, yes, buffs and general audiences alike can appreciate the operatic grandeur in Lang’s depiction of a society divided into two distinct classes: an uber-strata consisting of people who live in airy skyscrapers and enjoy the advantages of civilized pursuits and an underground class of workers, who spend the miserable currency of their lives keeping the engines of Metropolis running. Several months ago, I was asked to write a piece about what it takes to criticize films. I plan to do that, but a newly minted reconstruction of Metropolis offers a starting point. Want to be a film critic? Learn as much as you can about film history by building up the catalog of films you carry around in your mind. Metropolis is as good a place as any to start. Although the movie hardly qualifies as arcane, the new restoration — including 25 minutes of never-before-seen footage — marks a significant contribution to the archival endeavors of those who labor to ensure that future generations can encounter as much of their cinematic heritage as possible. Fair to say that when it debuted, Metropolis probably felt as encompassing to bygone viewers as a movie such as Avatar felt to today’s audiences. And Metropolis — coming earlier in history — is more of a groundbreaker in terms of set design, effects, and lighting. That’s not to say that the film doesn’t look and feel a bit dated. But that’s not really the point: The point is to try to see Metropolis as it might have appeared to people in 1927, to return to a time when cinema more readily inspired a sense of wonder, when movement could seem truly magical. Early on, it was clear that film not only could replicate reality, it could re-imagine and expand it. Lang’s story focuses on Freder (Gustav Frohlich), the son of Joh Fredersen (Alfred Abel), the man who runs the city of Metropolis with an arrogance and aloofness that might shame even the haughtiest of aristocrats. One day, Freder — who initially seems little more than a happy fool — sees a beautiful woman (Brigette Helm). Stricken, he follows her into the underworld, where he’s appalled to learn how the other half lives. Helm’s Maria, a saintly figure, preaches to the downtrodden masses, offering them hope, and Freder comes to see himself in the role of The Mediator, someone who can bridge the gap between society’s brains and the brawn it takes to make things work. Add to this, the evil C. A. Rotwang (Rudolf Klein-Rogge), an inventor who creates a robot to service his sick, romantic dreams. He’s also seeking revenge on Joh Fredersen for taking the woman he loved. We also meet the sinister Thin Man (Fritz Rasp), a fixer type who does Joh Fredersen’s dirty work. As critic David Thomson points out in his invaluable New Biographical Dictionary of Film, the most memorable aspect of Metropolis centers on Lang’s frightening images of crowds. Early on, we see a shift change at an underworld factory. Masses of anonymous workers, all in uniform, lumber through the gates of the factory, marching slowly in step, an army of the living dead. It doesn’t take much imagination to see this lockstep walk of doom as a foreboding of some of the worst moments of 20th Century history. Individuality was not a God-given right or even a part of one’s genetic inheritance. It was something bestowed by economics, notably the privileges that accrued to those who lived in the above-ground splendor of this futuristic city, often indulging their taste for salacious pleasures and frivolous diversion. Some of Metropolis’ images portray people in the underworld as if they were cells swarming madly through a body that cared nothing for their welfare. Lang captured the climate of dehumanization that became apparent during the First World War and which would be augmented as the century ripened. A work such as Metropolis presents us with a splendid opportunity to discover the vision of a master filmmaker at a time when a total vision of society seemed more possible. Metropolis wasn’t just a city; it was the world as Lang saw it, complete with images that must have terrified its maker as much as they inspired him to look for ways to unshackle ordinary people from the oppressor’s yoke. Did he really understand how this might be accomplished? Probably not. But we don’t look to Metropolis for answers to political questions. We look because we need to remind ourselves that filmmakers can be wild visionaries and that this is not a new phenomenon; it’s deeply embedded in the history of the medium. Consider Metropolis, which will be released on DVD later this year and which is working its way around the country in theatrical release, a preview of coming attractions for other visionary efforts in which directors reach for spectacle and meaning. Blade Runner often is mentioned as one of Metropolis’ many dystopian heirs. 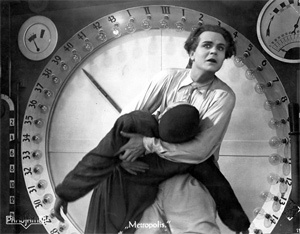 In reporting about the restored Metropolis, The New York Times noted that the movie long had been treated as an early example of big-screen science fiction, but that the new edition feels different. To my eyes, it seems more interested in the mechanics of betrayal than other versions I’ve seen, notably the 1984 edition in which music producer Georgio Moroder tried to give the movie a contemporary music beat. Lang, of course, had a long career. M (1931) — the director’s first talking picture — remains a harrowing and essential work of German and world cinema. In 1933, Lang fled the Nazis to work in America. He adapted to life in Hollywood with such wonderful movies as You Only Live Once (1937), The Woman in the Window (1944) and Scarlet Street (1945). But Metropolis remains a motion-picture landmark and now it can be seen in a way that’s probably closest to what the director intended. Metropolis also embodies one of the contradictions that make cinema so vibrant: It sweeps us into an alternate universe, even as it reminds us that movies can redirect us back toward harsh realities. At its best, Metropolis is a grandly mounted vision of utter despair.